Each tablet contains Olmesartan Medoxomil INN 20 mg and Hydrochlorothiazide BP 12.5 mg.
Angiotensin II formed from angiotensin I in a reaction catalyzed by angiotensin converting enzyme (ACE), is a potent vasoconstrictor, the primary vasoactive hormone of the renin-angiotensin system and an important component in the pathophysiology of hypertension. It also stimulates aldosterone secretion by the adrenal cortex. Olmesartan blocks the vasoconstrictor and aldosterone-secreting effects of angiotensin II by selectively blocking the binding of angiotensin II to the AT1 receptor found in many tissues (e.g. vascular smooth muscle, adrenal gland). In-vitro-binding studies indicate that Olmesartan is a reversible & competitive inhibitor of AT1 receptor. Olmesartan does not inhibit ACE (kinase II, the enzyme that converts angiotensin I to angiotensin II and degrades bradykinin). Hydrochlorothiazide is a thiazide diuretic. Thiazides affect the renal tubular mechanisms of electrolyte reabsorption, directly increasing excretion of Sodium and Chloride in approximately equivalent amounts. Indirectly, the diuretic action of Hydrochlorothiazide reduces plasma volume with consequent increases in plasma renin activity, increases Aldosterone secretion & urinary Potassium loss and decreases serum Potassium. The renin-aldosterone link is mediated by angiotensin II. So, co-administration of an angiotensin II receptor antagonist tends to reverse the Potassium loss associated with these diuretics. 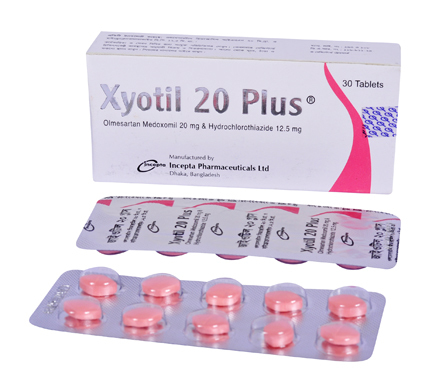 Xyotil 20 Plus is indicated for the treatment of hypertension. The usual starting dose of Xyotil 20 Plus is one tablet once daily. Dosing should be individualized. Depending on the blood pressure response, the dose may be titrated at intervals of 2-4 weeks. The usual regimens of therapy with Xyotil 20 Plus may be followed provided the patient\\\\\\\'s creatinine clearance is >30 mL/min. In patients with more severe renal impairment, loop diuretics are preferred to thiazides. So, Xyotil 20 Plus is not recommended. No dosage adjustment is necessary with hepatic impairment. The common side-effects are nausea, headache, dizziness, hyperuricemia, upper respiratory tract infection and urinary tract infection. Other adverse effects are chest pain, back pain, peripheral edema, abdominal pain, dyspepsia, gastroenteritis, diarrhea. - Periodic determination of serum electrolytes should be performed at appropriate intervals to detect possible electrolyte imbalance like Hypokalemia, hyponatremia and hypochloremic alkalosis. - Hyperuricemia may occur in certain patients receiving thiazide therapy. Safety and effectiveness in nursing mother & pregnancy have not been established. The drug should be discontinued during these conditions.